Matt Sewell is a writer and artist living in England who previously has brought us titles such as Our Garden Birds, A Charm of Goldfinches. In The Colorful World of Dinosaurs, he’s taken on a larger, terrifying and more famous animal than any other winged creature. 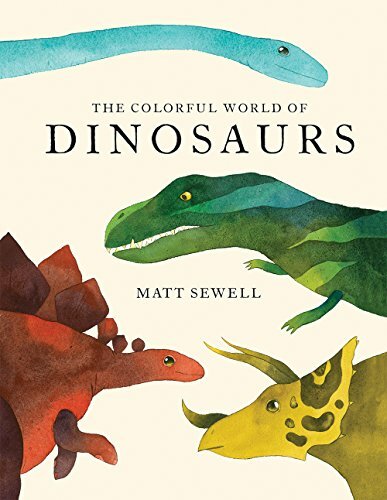 Sharing exactly the right amount of information, and with colorful watercolor illustrations, Sewell delivers fun facts, behaviors and habits of these legendary beasts to the reader, even to readers who may not be dinosaur aficionados. After learning about 45 of these creatures, it’s impossible not to go back to the book to enjoy it over and over again. Sewell wants to educate us, and he does in an easy, conversational tone that is inviting and never patronizing. He begins with the taxonomy, that is, the grouping of dinosaur species. There are six of them. Of the individual dinos he covers, two, pterosaurs and ichithyosaurs roamed the earth at the same time as dinosaurs and shared their ecosystems, but they’re not dinos at all. We learn about their diets: meat eating, plat eating, meat and plant eating, fish eating and insect eating. And we read about the climates they inhabited for 160 million years between the Triasssic, Jurassic, and Cretaceous eras. But 66 million years ago, dinos became extinct. Was it an enormous asteroid from outer space that blasted the earth? Or was it volcanic eruptions or climate change? These animals—cousins to contemporary birds—varied in size, temperament, locale, and looks. Sewell gives us the measurements, weight, time period, and diet. His art work compliments his descriptions, for instance many dinosaurs weigh up to 16 tons, have spikes, sharp teeth, claws, horns, feathers, plates, beaks, turtle shelled helmets, and wings. His illustrations are detailed and friendly but the depictions of jaws, teeth, tails, and mass of the animals stop short of cuddly. This is a book that will live long in children’s hearts and one that parents will delight in sharing with their kids and each other.